Adventures of a 21 year old seamstress and 7-year business owner. Did you know that George Washington, at the age of 16, wrote a small pamphlet about manners? There are 110 'Rules of Civility and Good Behavior' which include where to sit at table, when to eat, how to eat, how to sit and so on. Most, however, are how to show respect to one who is 'higher in station' than yourself. The class system does not exist as it did 200 years ago, but I believe an important lesson can be taken from these 110 rules. Show respect for your elders, whether you know them or not. A very good summary of the pamphlet is this: "Honor your Father and Mother, and love your neighbor as yourself." "Labour to keep alive in your Breast that little spark of Celestial fire called Consience." This is a quick little post about today's project. I have previously done these patterns, but I thought it was worth a quick note anyway. This dress was inspired by a costume from the movie 'Luther'. I love this movie, and I have always been intrigued by this dress. I was so happy when I found a way to make it into a doll dress! It's not exactly the same, of course, but I hope that you can see the similarity. So far this dress has been very p opular. It's truly beautiful with woven gold and white ribbon, gold organza, and embroidered white eyelet. Here is the official photo of the finished product and the picture that the dress is based off of. In ways it is exciting to begin a blog...but in other ways it is quite daunting. What could I possibly have to say that would interest others? I have had some experience in writing, and I have been waiting until the Christmas rush was almost complete before beginning this blog. It takes time to start. So perhaps I should start at the beginning. Hello! My name is Emily Marsh. I am 19 years old (a fact that I usually try to avoid), I was homeschooled all the way through, and I am a born-and-bred Virginian. 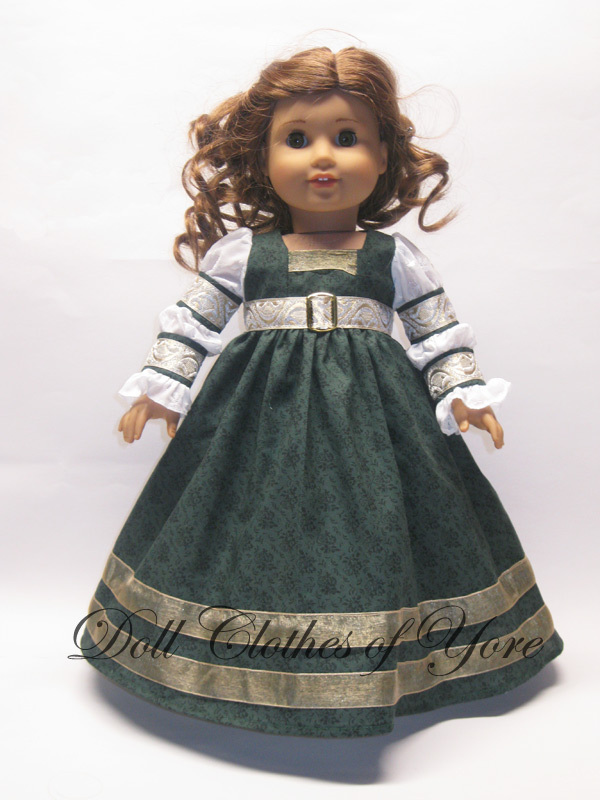 I have always had a love for history, and five years ago I decided to start my own business designing, making, and selling doll clothes to fit the American Girl doll. The back story to this is very long, so I won't try to type it all up. It's enough to say that I was taught to sew by my mother at the age of twelve, and I taught myself how to design high-quality doll clothes. I also have designed many pieces of adult and children's clothing. What will I write in this blog? 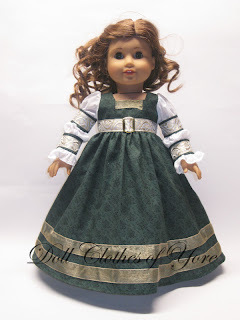 New doll clothes designs, inspirations, full-size projects, and stories. Maybe even a historical movie review or two. So come along with me and enjoy! In this blog I share with you the adventure that it is to be a business owner. I am 21 years old and I have run my online business, 'Doll Clothes of Yore' since 2006. What do I do? Well, I'm a seamstress, of course! This blog will feature my new designs as well as upcoming projects. Who knows, perhaps an entertaining story will pop up every once in a while! The 'Doll Clothes of Yore' Website!